How Police Reports Can Impact Your Insurance Claim - The Hart Law Firm, P.A. Building Lifelong Relationships... One Client at a Time. Do you need a divorce lawyer? One of the very first documents we will receive when investigating a new claim is the police report. We will review this document before we get your medical records, before we talk to witnesses, and before we let our client talk to the insurance adjuster. What is or is not contained in this important document can have a huge impact on your claim. Whenever there has been an accident, the police will typically, but not always, be summoned to the scene to prepare an accident report. In North Carolina, if the accident involves a death, injuries, or damage to property exceeding $1,000 then you MUST notify the local police, sheriff, or highway patrol. Failure to do so could result in a suspension of your driver’s license. This article is intended to provide you with general information on how a police report can affect your claim for personal injuries after a car accident. The information may or may not apply to your case. If you have questions, only an experienced auto accident or personal injury lawyer can answer your questions. What if the Police Don’t Assign Fault? If you were involved in an accident and either you or someone else at the scene is seriously injured, you should call 9-1-1 immediately. If you are unable to do so as a result of your injuries, you should stay put or shout for help from another motorist. After the police arrive, they will attend to everyone involved in the crash to determine whether everyone is safe. They are likely to call paramedics immediately if they feel that anyone involved will need medical care. After the police have made sure that everyone is safely attended to and out of harms way, they will begin the process of directing traffic and assessing the scene. After making sure that everyone is safe, the primary job of the police is to document what happened in the accident, determine whether any laws were broken, and make an initial determination of who was at fault. They will typically take notes or use a worksheet to gather all this information and then type up a written report later. The officers may also take photographs of the vehicles involved and the scene of the accident. If they believe that anyone was impaired, they may request that those parties take field sobriety tests and could place people under arrest for DWI (driving while intoxicated). They may also issue citations if they believe that any traffic laws were violated. After the scene of the accident is cleared of all vehicles and the people involved, the police officers may choose to follow-up with any injured parties at the hospital or their home. They will want to interview everyone and determine the extent of each persons’ injuries. After all of their follow-up is complete, the officers will return to the police station to type up an official accident report. As soon as it is available, you should obtain a copy of the final police report for your accident. If you live in Wake County, you can obtain a redacted police report online by visiting the City of Raleigh or Town of Cary police department pages. You may also obtain a report by visiting the Wake County Sheriff’s Department page or the NC State Highway Patrol. If you live in another town or county in North Carolina, you should check your local police department web page for instructions on how you may be able to access a police report online. You can obtain a significant amount of information from the police report, including the names of all drivers, the insurance information, whether any citations were issued (and to whom), a diagram of the accident, and a quick summary of what happened. If you call our office seeking legal representation, our staff will pull a copy of your police report while they are on the phone with you. After you open up a claim with the insurance company, they may ask you for a copy of the police report or they might obtain a copy on their own. We recommend that you keep a copy of this report for your personal files. You may need it to send along with a demand letter or provide it to a personal injury attorney should you decide to contact an attorney. The police report may or may show who was at fault in the accident. Either way, the claims adjuster recognizes that the police officers are people just like everyone else, and as such, they sometimes make mistakes. For that reason they will conduct their own investigation, interview their own witnesses and trying to determine for themselves what occurred ducting the accident. It’s even possible that a claims adjuster may uncover some sort of evidence that the police officer missed entirely. However, in most cases the police report remains the most unbiased and authoritative legal document about what happened in an accident and who . As such, many claims adjusters accord a great deal of deference to what was included in the accident report, and use it as the most accurate assessment of what occurred. In addition, the police report will carry a great deal of weight with a jury should your case ever make it’s way to court. This can either help you or hurt you depending on whether or not the officer investigating the accident found you to be at fault. Unlike in criminal investigations where the jury must find a defendant guilty beyond a reasonable doubt, in a personal injury case the jury need only find that is more likely than not that the accident happened the way you said it did. And whether the police agrees or disagrees with your version of events can easily sway a jury one way or another. As a result, if you disagree with the findings of fault in the accident report, you should contact a personal injury attorney right away. Although it is rare, if the police officer does not assign fault in the accident report, you will need to develop your own evidence showing that the other party was to blame. This could include talking to witnesses, locating security cameras that recorded the accident, or even hiring engineers or accident reconstruction experts to testify as to what happened in the accident. 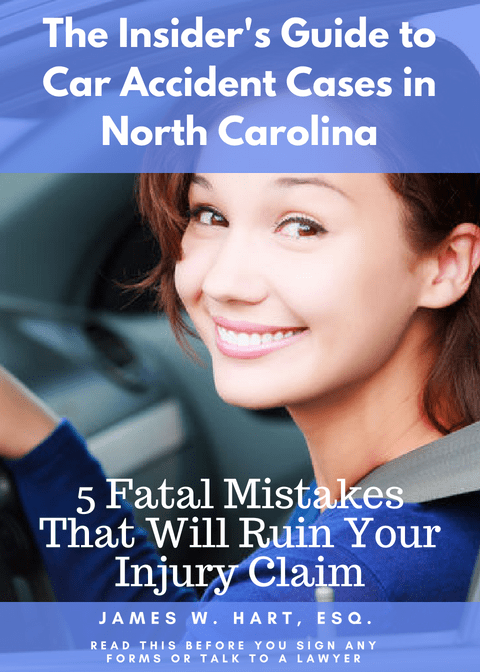 This is especially important with the contributory negligence rules in North Carolina – it is vital to show that the other person was 100% at fault for the accident. If you can’t do that, then you will lose your case. If you have a question for us, you can submit it confidentially online by clicking here. You can also call The Hart Law Firm at (919) 883-4861. We are happy to speak to you and answered any detailed questions you may have.